In 2014, we were thrilled when @JustinRose99 honored Payne Stewart by striking the pose on Sunday during the @usopengolf. On Wednesday night, Pinehurst Caddiemaster Jimmy Smith will be enshrined with the second class of the Pinehurst Caddie Hall of Fame. The honor is well-deserved. But there was one day when Elvis, as Smith is affectionately nicknamed, might be slightly dinged for a less than hall-of-fame move. Before the 2014 U.S. Open, then defending champion Justin Rose visited Pinehurst for a few private practice rounds. 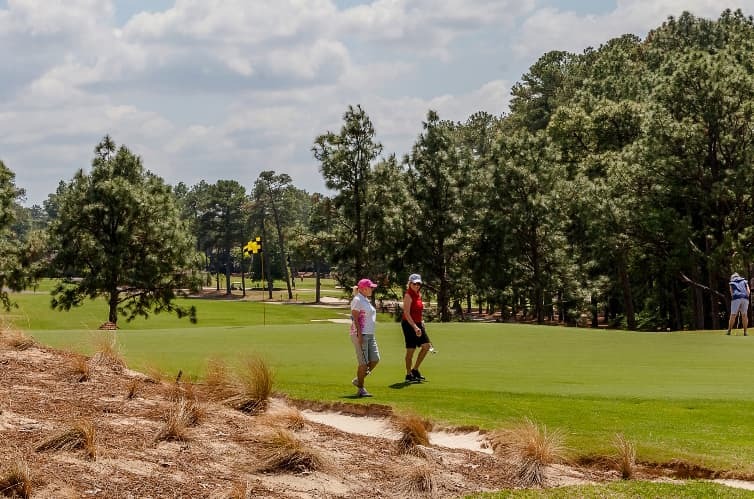 Playing with legendary Pinehurst caddie Willie McRae, and his own caddie, Rose stepped off the first green and headed for the second tee nearby. Smith was with the group. Pinehurst Caddiemaster Jimmy Smith, aka “Elvis” hangs out in the 2014 U.S. Open Players Scoring area. Just then, directly across the street from No. 2 in the Village of Pinehurst, The Village Chapel began to chime on the hour. Rose and his caddie Mark Fulcher, both Brits, immediately stopped. They abruptly turned toward the chimes, removed their caps, placed their hands over their hearts…AND SANG. Smith witnessed the moment. Furiously, he reached into his pocket, searching for his phone. It was on his desk in the caddyshack, charging. “It would’ve been the greatest video,” Smith said. Congrats, Elvis, on all of the other Hall-of-Fame worthy moments.